One Lucky Day: From inspiration to manifestation! Remember a couple of posts back (posted on November 30th) I commented that I had a fixation over a certain lamp from the Pottery Barn catalog? It was suggested that I try using the 7gypsies "ATC/Photo display" to create a mini version of the original. This is a naked 7g ATC/Photo display and how it usually is put together. Instead of having the 3 rings on the stand go from smallest on top to largest ring on the bottom as shown above, I reversed that and put the largest ring on the top (shown below). I ended up only using 2 rings, leaving out the smallest ring. I used pieces of vintage 7gypsies tissue (I know some of you are still hoarding it) and "believe" twill (more vintage 7g product). I swiped a single light with a cord from one of my Christmas decorations and attached it to one of the "spokes" on the rings. It was fun to put together and quick, just clip everything on. 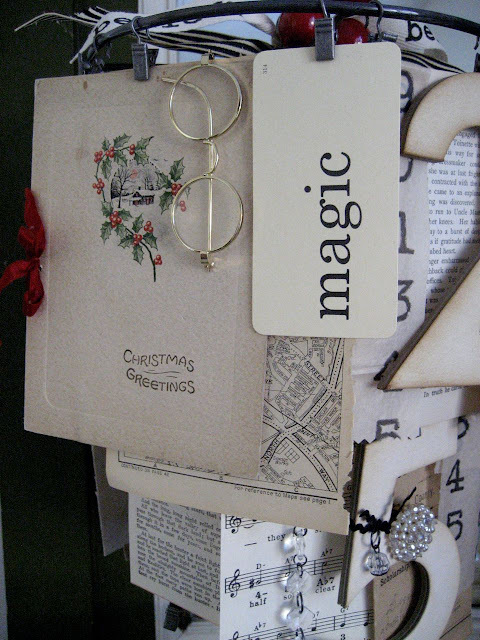 Add more photo or use it as an inspiration board with all you favorite things clipped on.....again, lot's of possibilities. Just fantastic! I love this piece!! I thought my display was vintage but yours takes the cake. It is amazing and I love it. Is that my Christmas present? Very cute! Oh my goodness!!!! I love it.... I really REALLY love it! The glasses and mittens made me smile! Aren't you so clever! I just love this project. that is soooooooo wonderfully creative and beautiful and amazing! love it! I am equally obsessed with the same Pottery Barn chandelier, but refuse to pay that price. Its funny, I bought the photo display months ago, realizing the similarities, but never thought to try to make this mimick the chandelier. Thanks so much for sharing!!! Genius! What an awesome, awesome idea! Absolutely amazing!! Love the crystal cake stand too...your creations excite me like no other...LOVE IT ALL! Debbie, this is absolutely exquisite! I miss being around your creativeness and attention to detail! Love it! This made me gasp--literally. W-O-W.
LOVE, LoVe, lOvE this piece! Great use of some neat stuff! Saw this on Facebook-WOW! No other word...WOW! This is amazing!!! I just posted about it on Facebook. You are so clever!! So amazing, simply pleasing to have things you love around you, displayed so artfully.Love it! Love it! Just saw it on Twitter! Love the blog background too!